iOS hacker Pwn20wnd released two new updates to the unc0ver jailbreak tool for iOS 11.0-11.4 beta 3 on Tuesday that encompass some rather important bug fixes and improvements. 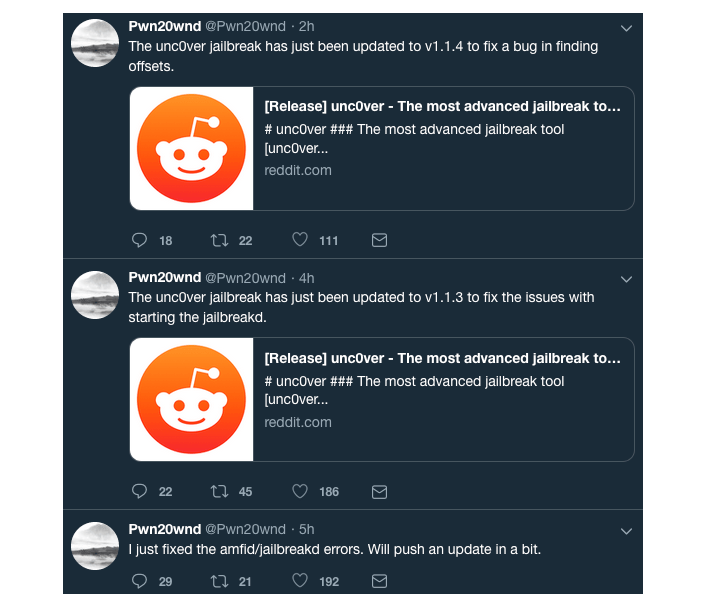 Pwn20wnd announced the updates by way of his Twitter account earlier this afternoon, noting how they should remedy a couple of known errors during the jailbreak process. If any of these bugs seem familiar to you, then you might want to download unc0ver V1.1.4 from Pwn20wnd’s official GitHub repository as soon as you’re able. Even those that aren’t facing problematic errors are advised to download the latest version to have the most stable jailbreak possible at this time. Have you downloaded unc0ver V1.1.4 yet? If not, we would highly recommend that you do. Share your experience with it in the comments section below.